World Premiere of "Social Creatures"
Trinity Rep in Providence wants you to dig yourself out of the depths of winter doldrums with the world premiere of "Social Creatures," a strangely-beautiful, beautifully-strange “dramedy” about the end of the world as we know it. Unlike anything Trinity Rep audiences may have seen before, this world premiere was commissioned in 2010 from Jackie Sibblies Drury -- an accomplished new playwright and graduate of the Brown MFA playwriting program. Performances run March 14 - April 21 in Trinity Rep's intimate Dowling Theater. Directed by Trinity Rep's Artistic Director Curt Columbus, "Social Creatures" is set in the aftermath of an international pandemic that has decimated humanity. A motley group of survivors is trying desperately to avoid contracting the illness that turns people into something indescribable. At the outset, the heroes are living under a strict set of rules imposed by the group’s self-appointed leader Mrs. Jones -- the first rule being not to use their real names. “We’ll use our real names when we’re able to be our real selves,” instructs Mrs. Jones. As the situation unravels, audiences will see the true nature of each character come into focus: one tries to maintain humanity even when it has long since stopped making sense; another becomes a superhero, even if only in her mind; while others are slowly seduced by the possibility of the ultimate escape, even if it means retreating from their own humanity. The eight-person cast features longtime Trinity Rep company members Timothy Crowe and Janice Duclos, guest artists D’Arcy Dersham, Alexander Platt and Nance Williamson with Brown/Trinity MFA graduates Darien Battle, Rebecca Gibel and Charlie Thurston. Brooklyn-based playwright Jackie Sibblies Drury has been in residence at Trinity Rep since February, serving as a guiding voice in the rehearsals, She is perhaps best known for her play "We Are Proud to Present a Presentation About the Herero of Namibia, Formerly Known as South West Africa, From the German Sudwestafrika, Between the Years 1884-1915" which had its New York premiere at Soho Rep in 2012. 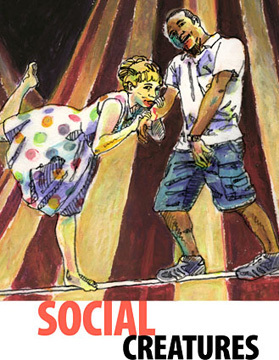 Talkbacks will be held after every performance of "Social Creatures." Audiences are invited to share their response to the play’s production and themes for approximately twenty minutes. Continuing Trinty Rep's tradition of offering affordable tickets for all, "Social Creatures" will have Friday, March 15, as its Pay What You Can (PWYC) night. Tickets will be on sale at 6:30 p.m. that evening, with a limit of one ticket per person. For information and tickets, stop by the box office at 201 Washington Street, call 401-351-4242 or visit www.trinityrep.com.